3rd August 2012. In this edition of the ExplorOz Newsletter we announce upgrades to EOTrackMe (including a new compatible device), new edition shop products, updates to the Canning Stock Route Trek and WA Permits articles, plus more developments to ExplorOz mobile. Also, find out about our Thermal Wear Giveaway for August, and who is July's $100 shop voucher winner. Member - Mike (SA) was presented with Lifetime Membership this week for recently coming onboard as an integral assistant to Michelle with the complex Road Conditions audit. Initially volunteering to perform status updates to his local area, he soon got deeply involved and is currently also performing the status updates Australia wide. Mike's been a member and contributor to the site for the past 10 years. Please join with us in thanking him for his support and contribution. The EOTrackMe system has been given an upgrade, in-keeping with the new site layout, you can now view latest position updates via list or map, plus view all of the "how to's" in our documentation section. We've also added a new compatible device - the Yellowbrick Tracker/Messenger. Read the device blog here, and keep reading for more information on Yellowbrick. G-Layer is the dealer for Yellowbrick in the Australia Pacific region. Yellowbrick 3 tracker-messenger is now available in Australia through our online store. G-Layer is excited to introduce the Yellowbrick products to all ExplorOz members, offering 100 FREE transmission credits and FREE shipping with the purchase of a Yellowbrick3 during the month of August. EOTrackMe integration is also available from this month. There have been recent changes made to how permits for the Canning Stock Route are issued that will impact travellers from September 30th 2012. If you're planning an upcoming CSR trip, you can find all of the latest information on our Canning Stock Route Trek note and the WA Permits Article pages. Since the introduction of ExplorOz Mobile in the last newsletter, development of the mobile site continues. The look and feel of the site has been improved, and navigation is much easier, plus the Forum is now operational for use on the go. Go to m.exploroz.com using your mobile device to have a look. Now you have even more reason (besides being warm, lightweight and great value) to try the new Rammite Thermal Wear range with this great giveaway offer for August, simply purchase any Rammite product from the ExplorOz Shop and go in the draw to win one of four Rammite Long Sleeve Crew shirts. Find out more in the Shop blog here. All ExplorOz Members can access fantastic deals from Business Members in our Member Rewards section. These are exclusive member offers on a wide range of equipment, accommodation and more... visit the Member Rewards page and start saving today! 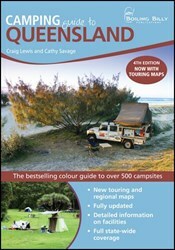 Boiling Billy's highly anticipated 4th Edition of the Camping Guide to Queensland is here, this is the definitive guide to camping in the region, perfect for any short trips you have planned for spring, find it in the ExplorOz Shop here. All-new Format 6th Editions in Stock Now! The Great Desert Tracks of Australia series has been reinvented for its sixth edition. The series now features 4 maps covering the West, Central and East of Australia, as well as the Simpson Desert, learn more in the ExplorOz Shop here. You too can be a winner - just by completing a Review for any of the products currently for sale in our shop, you'll go in the monthly prize draw. Whether you bought it from us, or not, have used it recently or long ago, provided it's the same product your comments help others.